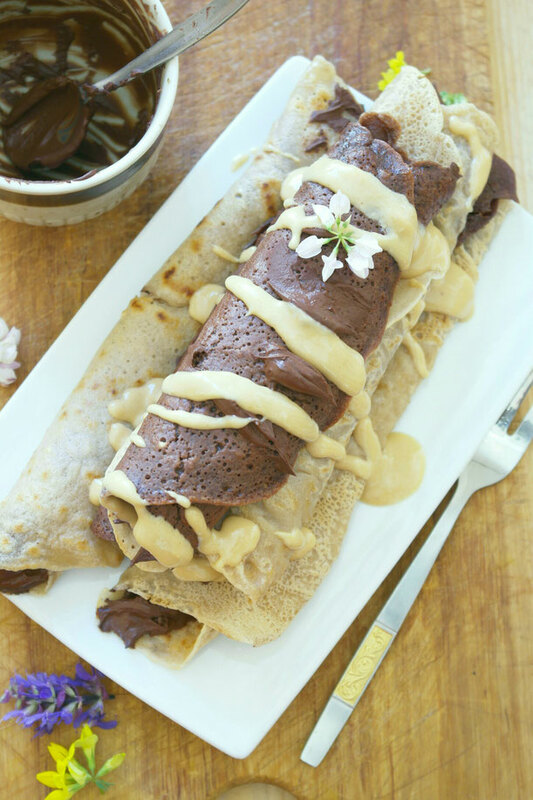 Vegan Crêpes made with Aquafaba - 3 ingredients - simply & healthy vegan recipes that taste amazing! Optional: 2 tbsp cacao, 2 tbsp coconut flour or 2 tsp cinnamon, cardamom, sweetener, herbs, or what ever you desire! Let the batter set for 5 minutes. Heat up a pan on a medium heat and for the first crêpe you may add a little coconut oil, for the other ones you don´t need any oil. Cook the crêpes for about 1-2 minutes each side. Tips: you can storage your crêpes in the freezer with parchment paper in between. 240 ml Hafermilch oder andere pflanzen basierte Milch + mehr (1/2 Tasse) wenn nötig, manche Mehlsorten saugen mehr Flüssigkeit auf als andere. Teig ca. 5 Minuten ruhen lassen. Ca. 50 ml von dem Teig in die Pfanne geben. 1-2 Minuten auf jeder Seite braten lassen. Zu Taschen oder Rollen falten, rollen und mit Schokomousse, Erdnuss Butter, Beeren, Früchte, Gemüse oder Schoko Creme servieren. Tipps: du kannst die Crêpes gut aufbewahren durch einfrieren und mit Backpapier zwischen jeden. Danach einfach auftauen lassen oder aufwärmen und beliebig servieren. Leave a comment below - I love to get feedback! Can you tell me, please, do these freeze well? If I can do the crepes in advance and freeze with layers of wax/parchment paper in between, I can absolutely pull it off! I am *dying* for the answer! I am so happy you want to try this out and use them on your event! I think that would work just fine if you freeze them with parchment paper in between, I haven´t tried it out, but if you like me to, I can try it out next week and get back to you! Or you can try it out! 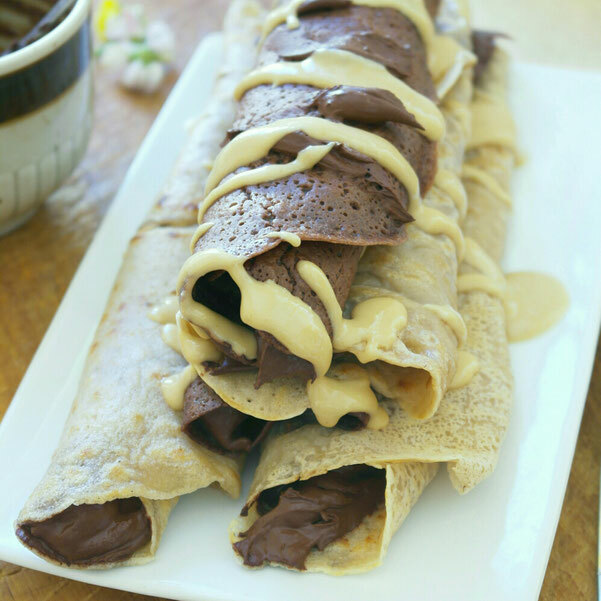 These crepes are super easy to make, hope you like them and good luck! If you could try it, that would be INSANELY amazing...if not, I will make sure to try it by the end of the month and make sure to keep you posted. I have both wax paper and parchment, so I can try both! Thank you for this recipe! 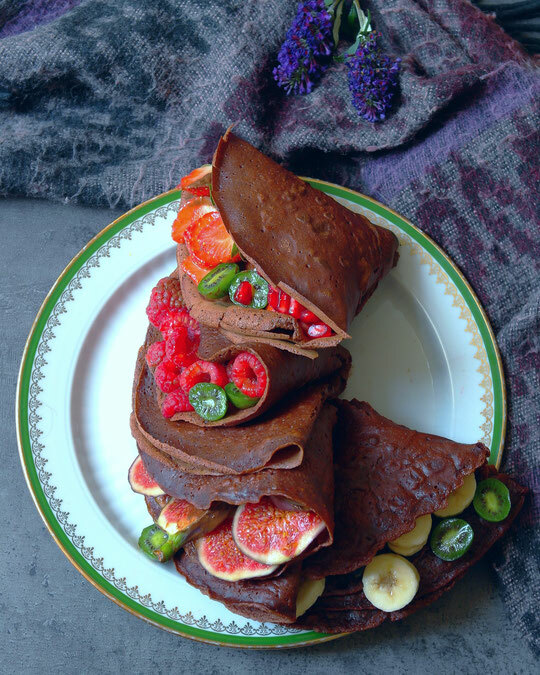 I am very excited to make 500 crepes , and know they are gluten free, and vegan, And healthy, AND there is the possibility of doing it in advance! I will try to make some this week and freeze them. Will keep you updated! Which kind of flour do you wanna use? Sounds terrific! I think they would fit perfectly with a savory veg fillings! So I have tested to make these crepes again and had them in the freezer overnight with some parchment paper in between. It worked just fine! They tasted still really good and were soft as before after letting them defrost. I tried to make them with rolled oats this time, just blend the oats to flour before adding the other ingredients. I really love them!!! And don´t cook on to high heat! BRILLIANT! Thank You So Much! I am truly hoping that this goes off blindingly well, and that I can get pictures to send you! You are *amazing*! Thank you for teaching me! Good protein for a base for a meal (maybe serve a mixed green salad along with it), the veg could be served alone...If you have any ideas, I would L O V E to hear them...I am still learning and I will GLADLY accept any assistance/advice you have! Thank You So Much! You are A M A Z I N G! I think that all sounds great and delicious! Be sure the veg-filling is not to wet, because the crepes will absorb much fromthe filling . You could also make some beetroot hummus from the chickpeas that are left over after taking the aquafaba/or from the canned chickpea. The colour is really nice and I think if would go well with smoked tofu and the veggies. (not spinach though). Or what about making it into a healthy lunch snack platter, with one crepe each person, with the fillings inside and 2 kind of dip sauces/dressings (beetroot hummus and avocado dip or tahini dip) and some green salad and sauerkraut! I have a lot of ideas haha! Be sure all ingredients are organic and vegan:)(especially the aquafaba and raw food. The veggies would be perfect as filling for the crepes and the other things (salad and dips) would be great beside them. This meal will be a great and healthy lunch and I am sure the quests will love them. I would suggest you to use gluten free oat flour for the crepes! I haven´t tried adding onion to the batter, but try it out! Maybe it can be more difficult to fold the crepes when you add the onions to the batter, but I don´t know really. I am happy to get your feedback! It's a convention I am cooking for. about 150 people, 20-50 of them (including VIP'S) are Gluten Free, Vegan or both. I am cooking 3 meals a day for 3 days, and 2 meals for 1 day. Doing platters isn't practical in that situation, that's why for the buffet line, it would be stellar. I have 5 LARGE (20 cup) rice steamers at my access. Have 2 in the VIP room running, have 3 in the staff suite running with the crepes being warmed and held. The veg will be cooked the day before it's served and held over sterno (gel heat source heating a water bath that the pan of veg is submerged in to keep it warm with less chance of overcooking). The chickpeas (as well as most of the other beans I am using) are already *mostly* planned for. I am likely doing a Channa Masala from the Minimalist baker (it went over like *wildfire* several years ago and have had requests for it), I have chick pea blondies planned for, Black Bean brownies, and a white navy bean, kale and tomato soup planned for. The event isn't until March in Baltimore, MD. If I can manage to get pictures before the room gets decimated, I would ABSOLUTELY **LOVE** for you to post them! I'm over the Moon for that idea! The recipe is very easy to follow and it taste insane delicious!! You have to try them! Thank you so much! So exciting!! !